Everyone knows what research now proves: nature is good for you. Be they gardeners, dog walkers, or wilderness wanderers, people simply feel healthier in the great outdoors. But why? So get out there! It’s good for you. The emoji platform, which tracks online sentiment and builds strategies through the use of emojis, found in a study that some 60% of respondents use emojis weekly, and many more frequently. 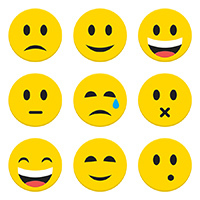 And, as Andrea Ayers wrote in the Crew blog: “Over a five-month period…emojis were used over 1.7 billion times on Twitter.” Ayers asks: “What exactly is driving our use of emoticons?” And responds: “The answer is quite simple, they make us feel good.” A lot of Facebook fans might well agree. Every year, hail causes some $1 billion in damage. Across the United States, there were 5,411 hail storms in 2015; 1,324 of those were in June alone. Are you ready? Hailstones range from pea-size to golf ball-size, and bigger. The Guinness World Records’ website reports that the heaviest hailstones weighed in at some two pounds (1 kg) as they crashed to earth in Bangladesh on April 14, 1986. If your property is peppered by damaging hail, there are steps to take to file a claim and receive compensation for the damage. First, however, you’ll need coverage. Typically, your homeowners &/or business insurance will cover repairs to your home/business if it’s damaged by hail. But depending on your policy, you may have a deductible to pay first. Talk to your agent, who can discuss policy options and recommend the best coverage for you. Document the storm. Not just the date and time, but the hailstones themselves. Photograph them, placing a tape measure next to one to show size. Document damages. Examine your roof, and take pictures of any damaged shingles. Photograph damage to siding and don’t forget to check outdoor air conditioning units. Take a peek in the attic to check for leaks, and wander the property for indications of other damage. Call your homeowners insurance claim phone number. Provide your policy number and your documentation. Your insurer will issue a claim number. A claims adjuster will be assigned to inspect your property and prepare a repair estimate. After inspection, the adjuster will file a report with your claim examiner, who will review it and make a decision on your claim. The outcome of the claim will depend on the severity of the damage, the way your house is built, and the insurance company’s evaluation criteria.